Not so long ago we reported on a rumour that was spreading like wildfire across the internet. According to Japanese magazine GameLab, the upcoming 3DS title Monster Hunter 4 hasn't been delayed for further quality enhancements - as Capcom has officially stated - it is in fact simultaneously being developed for the PlayStation Vita with a view to releasing both versions together. I would not believe everything you read on the internet. It will set you up for disappointment or misdirected frustration. The PS Vita is struggling to gain traction in Japan, while the 3DS consistently outsells all other systems combined, with the handheld recently surpassing 10 million units sold in Nintendo's homeland. Though it's not out of the question that Monster Hunter 4 will one day end up on the PS Vita it's unlikely that it will be released on the very same day as the 3DS. Further rumours are floating around that the game can appear on Sony's handheld after three years of 3DS exclusivity - however Svensson's post seems to cast doubt on the game ever making it onto the ailing system. What are your thoughts on this one? Is it conceivable that any of this is true? Fire-off in the comments below. Well there you have it. Capcom have officially denied a PSVita version of Monster Hunter 4 is in development. Expect it to turn up on the Vita, Spring 2014. Aw...shrugs It'll be ported to some other system eventually. I look forward to that day. troll Capcom. they've been trolling like this long before MML3. ...Something tells me Sony fans are jealous. So, should we believe your tweet about cancelling Megaman Legends 3 due to lack of fan support? Well that's kinda disappointing. The Vita definitely needed this title. I was thinking of buying a Vita for TearAway and if this came out more vitas would be sold and in turn,more games made for Vita. That was a non-denial denial. He didnt rule out the Vita version, just warned people not to trust rumors. Hopefully Capcom is being truthful. Without Monster Hunter, Vita is almost surely doomed to fail. If PSP hadn't been saved by the Monster Hunter series, I'm sure it would have met a similar end. Once this game hits 3DS, there will be no hope for the Vita in Japan or really, the rest of the world for that matter. No, the Vita will not get MH4. It will get MH4 Ultimate, or however they want to call it. The game makes more sense in Vita anyway, with its native twin sticks. "The PS Vita is struggling to gain traction in Japan"
Isn't that sugar coating it a little? I mean, it's struggling to get traction anywhere. It hasn't even hit 1.5 million in any one region yet. Don't care for Vita anyway. 3DS would seem the better match, being that it is playable with the Wii U version of the game. Honestly folks, even if you WANT a Vita version, why wouldn't they have already announced something like that if it was going to come out? "The game makes more sense in Vita anyway, with its native twin sticks." The best selling Monster Hunter games were on the PSP, which had only one stick. @sonicriders You're thinking about MH3U. MH4 has no Wii U version. Seriously I'm very curious about the lengths Nintendo must have gone to get Capcom to turn their backs on Sony and what would clearly be the superior system for this particular game. At least vita owners have Soul Sacrifice to look Forward to. It's very similar to Monster Hunter but with a darker tone. So maybe PSP? PSP might have another 6-7 years if Vita doesn't survive. All I can say is (Nelson voice) HA! HA! @sinalefa If it makes more sense, why didn't they release it on it in first place? Also... Have you ever heard of the Circle Pad Pro? Well, that's ONE way to both avoid and answer a question. ...but there will be an iphone version, right? I don't have any particular desire to see this on Vita, but that comment is far from a "denial." @TrueWiiMaster Maybe in terms of sales yes, but gameplay-wise Monster Hunter is far more suited to twin- analogue control; putting your hand into some awkward claw shape position makes the gameplay far more frustrating. @Magnet_Man018 because the 3DS is far outselling the Vita perhaps? MH would be far more suited to the Vita, but game companies go where the money is, (especially Capcom) and in this case more money is gonna come from the system with the largest user base, aka the 3DS. "I would not believe everything you read on the internet. It will set you up for disappointment or misdirected frustration." I'm sure they'll finally sell that CPP XL same time as MH3U. I would not believe everything you read on the internet. Does this include your statement ? I find this a good thing. Vita is starting to flop due to lack of games and support, so it's gonna be a boost for the 3DS. Even if it was on the Vita, the 3DS version will probably outsell the Vita version, but still, this could help the Vita..........be more loved, but still, since it's also on 3DS, maybe not as much people will even get the Vita version in the first place. This is why fools shouldn't make up rubbish & spread it over the internet, people are willing to believe anything! I never believed this for a second, just some N4G Sony fanatic spreading nonsense. Just the Wii U rumours a year ago, or the ps4/xbox 3 rumours we're getting now! "however Svensson's post seems to cast doubt on the game ever making it onto the ailing system." ^Might want to double check your dictionary first. I'd rather the Vita get a new Exclusive Monster Hunter anyway. Do we need to type out the Vita sales figures vs 3DS every single time we write we write an article involving it? All it seems to serve is to bring lots of daft fanboy chest-puffing into the comments section. I assumed it was fake, so I'm not surprised. Capcom may have just decided not to release it on Vita because of Soul Sacrifice or something. Either way, I don't own a Vita and don't plan on getting one, so I guess this is just a meh for me. Now if Sven decides to spill the beans on localization for MH4, THEN I'd be interested. @CanisWolfred no ReshiramZekrom is correct that should be 'FAILING' system. Poor delusional Vita owners. The truth hurts doesn't it? Although anyone still buying Sony products has probably gotten numb to it by now. @Raylax They'd do it anyways. Let's be honest here. They don't need provocation to gloat about something that honestly has nothing to do with them. Sounds to me like a vague statement from a guy who's grumpy because no one can keep a secret. But I hope I'm wrong (in a terrible sort of way). This is not a big problem I have both handhelds and i'll play it on the 3DS first and later on my Vita in 2014 or so when the contract with Nintendo expires for MH. Sad to see that Nintendo fanboys being so desperate at times like this wishing it was not true. You are that scared of the Vita? Common guys, having the game on both handhelds will be great. @FrozenCthulhu ...yet. It will come, eventually. Monster Hunter 4 HD Vers. Ideally, MHP4th for Vita, then MH4G for Wii U. Don't care! Has Soul Sacrifice! Nothing wrong with being happy about this as we are losing the exclusive Resident Evil Revelations to XBox and PS3. So would be good to still have some capcom exclusives. The bullies will always lose. I'm hoping Capcom will do this for the PS Vita, even though I don't own one. 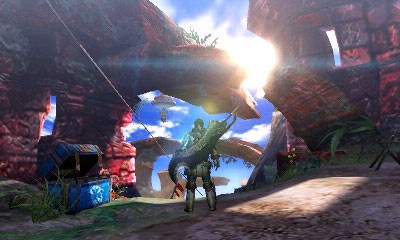 @Blaze Monster Hunter would look amazing in 3D. The Vita is incapable of 3D. @ReshiramZekrom @MadAussieBloke Are you both seriously saying you don't know what ailing means? @SanderEvers Many more as in how much? I have around 20 games for Vita right now. Which is physical which doesn't include digital? Wanna compare? Bring it. @C-Olimar But wouldn't you prefer HD, a brighter, larger screen and dual-analogue to 3D? Maybe I'm in the minority here, but the 3D really doesn't matter to me; I very rarely use it. But anyway, different people have different opinions, but if it was on both the Vita & 3DS, everyone could get what they want out of MH4. Who still uses the 3D on their 3DS anyway? That novelty wore off within a week for me. I actually remember a time when there wasn't a plague of childish fanboys - I'm starting to miss those days. @Slapshot I envy you. I don't even remember those days. Also, we'll all find out how "amazing" 3D would be for Monster Hunter with MHTU, either with the demo in February, or the full game in March. @Blaze First of all, Vita isn't HD. It's qHD, meaning it's 1/4th HD. If I cared about a larger screen I'd get an XL. Brightness? I'll just use my powercase to charge my 3DS on the go, putting it at max brightness. 3D is more impressive than qHD in my opinion, but yes, if it was on Vita everyone could be happy and we could cease the bickering. @Blaze and as for dual analog, a CPP+3DS costs less than a Vita. All that said, I still like the Vita somewhat, I just don't want one. If Nyko would just release the Powergrip Pro than the issue of brightness, dual analog, and battery life would all be solved. So much for the Vita being successful, eh? @TheLilK98 I understand what you're saying, but it's quite a lot of effort to go to, especially considering many don't want a CPP due to the mass of extra bulk it adds to the console. Also, even with brightness at full, the 3DS is no match for the Vita's OLED display; they're pretty much incomparable, not to mention the fact that as of now there is no CPP XL for the 3DS XL, and when it does release the thing will hardly be very portable, and although technically the Vita is not HD, the smaller screen display makes the system very nearly HD, and far more powerful than the 3DS graphically. In essence, you can't have what the Vita can offer on a 3DS even with the mass of accessories available on the system. @Rei7 20 games for the Vita, that are actual Vita games? I didn't even know that thing had 20 games out yet. I don't have anything against Sony, I own a PS3 and love it... but they should just walk away from the land of handhelds and leave it to the original masters of right-priced fun. I don't want to play Uncharted on the Vita, but that is just me. I'm not much of a fan of LBP. It's a good game but doesn't do it for me. I don't want to play FPS' on a handheld. The memory cards are ridiculously priced. The system itself is over-priced. The list of negatives is extensive. Again, I don't dislike it, it is just what potential buyers are going through. I'm thinking about a PSP for PS1 games though. It seems like many people want the PSP more than the Vita. The numbers would agree. @Blaze the 3D doesn't really matter.... The awesome games, however, do. Nintendo always knows this. They never blow you away with hardware, but they do with software. That is the way Nintendo has always been. They take the technology of today and make it new again, while other companies like to throw tomorrows tech into their system in a very non innovative way (basically a PC with a game controller). Mostly anything innovative from them is a sort of "copy and paste and improve"... which is creatively weak. It really all comes down to taste, in the end. Some people enjoy Nintendo, some people enjoy Sony, some people enjoy MS or PC. Some people enjoy all of them or none of them, or a mixture of some. I still play NES, SNES, GBC and GBA games. How are they still relevant even though they are graphically inferior to todays games? Because they are works of art. Console technology doesn't matter as much to me, or a plethora of others, as quality, innovative, fun games do. PSP didn't do well in their first year. So that doesn't bother me too much. I'm loving my Vita more than my 3DS due to a lot of reason and I had both at the same time. 3DS games are more childish in a lot of ways that is why it doesn't appeal to me that much. But i'm still waiting for MH and Animal Crossing: New Leaf. I don't hate any console or handhelds but the thing that I would like to point out is that Vita has tons of games already. I am by no means in any side of any fanboyism. I own a PS3, DS, 3DS, Vita, PSP and an epic gaming pc rig. The amount of immature fanboys on this website disappoint me. It's like the Super Nintendo VS Sega Genesis debate all over again except for less facts and more mud-slinging. This isn't really a denial, but more of ''it may or may not happen'' kind of comment. And a Vita port may not happen right away if it does happen. I can see Capcom porting Monster Hunter 4 to the Vita easily several years after the 3DS version. They love to port their games after all. @Blaze Yeah, that's why I never got the CPP. Which is why I really wish Nyko would just release the Powergrip pro, which is basically a streamlined CPP that adds battery life. The 3DS screen is bright enough for me, I don't really need a lighthouse in my pocket. Yes, it's true you can't get some things the Vita has on the 3DS, but there are also things you can get on the 3DS you can't get on the Vita. The most obvious is the 3D, which, to me, is more impressive than near HD. The Vita has better graphics, but the 3DS isn't a pushover either when it comes to visuals. You also don't have the dual screen interface on the Vita, and the rear touchpad was stupid to me. @Rei7 65+ games, but not 65+ good games. It's fun to make believe though. @Gamesake Because clearly your tastes prove you're a universal indicator for good games. Back on track...I still feel that they aren't gonna release a possible Vita version on day 1 with the 3DS version. If they're almost done, why delay for a port when they could get sales now, then get more sales when they release the Vita version? I just think the delay was only to ensure the game was complete, and released on a less busy timeline (summer usually has less AAA releases). @Bucho They're Capcom. Anything can happen. No. I would rather have the 3D. Actually when it comes to brightness I was actually thinking the screen on the Vita is fairly dim. The OLED screen on my Galaxy S3 is MUCH brighter than the Vita. It is like they limited the brightness on the Vita so as to not get the notorious OLED screen burn in. The 3DS screen will outlast the Vita by far. It will still look clean when the screens on the Vita all go yellow after a few years. I have a Vita, a kind of impulse buy, but I never use it. It is not that it isn't good it just seems like a shrunk down console. If I want a console experience I reach for the PS3 or 360 controller instead which plays on a MUCH bigger and brighter HDTV compared to Vita. Right there in the same boat with you. I am a happy owner of quite a few gaming systems (Including a high end PC, 3DS, and Vita), and like them for different types of games. Monster Hunter is not a game I want on my 3DS, nor am particularly interested in. For one, the trailer I saw for MH4 on 3DS looks pretty bad in terms of graphics, more like a DS game than something that really takes advantage of the 3DS (Kid Icarus or Resident Evil anyone?) and graphics are pretty important in a game like this. If you want to sell me another Monster Hunter game on the premise of going around and hunting monsters, the monsters need to be interesting to hunt. Muddy looking textures certainly do not help this, and the trailer really failed to make the game look like something worth buying in that regard. Of course, graphics can be forgiven if the gameplay is good, but I'm not convinced that MH4 will be all that great. I found the various PSP releases difficult to play at times due to the lack of a second stick, and I honestly don't see Capcom making it much better by using the touchscreen. If you remove the touchscreen from play, all you're really left with is the same inputs as the PSP did, hence my concern. Now MH4 has me questioning its controls, and thusly its gameplay, while I'm still in doubt about the graphics. Putting this on the Vita would offer Capcom the chance to wipe away these concerns for me and to convince me to invest in this title. Regardless of if this is a simultaneous release or not, I think the Vita is the handheld where Monster Hunter belongs for moving the series forward. As to all of the people who are gleeful that this game isn't coming to the Vita. MH4 on the Vita would not hurt your precious 3DS. The 3DS has achieved more than enough sales and support that one game, or even a slew of games, isn't going to cause it to suddenly die. By celebrating that the Vita is failing to sell, you're celebrating that somebody's hard work is failing, that people are losing their jobs, and that a system that is just as innovative and exciting as the 3DS was when it released is being ignored in favor of mobile games. Somebody who is a real fan of Nintendo wouldn't want Sony to fail because Sony has done a great deal for the gaming industry, and benefiting the gaming industry benefits everybody. It was on a Sony system that open world gaming became successful for consoles; something I'm guessing plenty of you do, or would, enjoy seeing in games on Nintendo consoles. It was on a Sony system that RPGs were able to move into the 3D realm and gain mainstream popularity on consoles; a move that is responsible for games like The Last Story, Xenoblade, and Pandora's Tower being considered worth making and localizing. It's Sony's gaming products that provide competition for Nintendo. competition that promotes innovation. Innovation that brings us new and exciting takes on games. Innovation that drove Nintendo forward with their online marketplace and product offerings. Sony is an integral part of the gaming industry; if they fall that means part of the industry falls with it. No true gamer wants to see the industry fall. Oh, and for those who want to play the "better games" card when attacking the Vita, there are plenty of quality experiences on both titles. Racers? Need for Speed Most Wanted is an amazing open world racer for Vita, just as Mario Kart 3D is an amazing combat racer for 3DS. The Vita has one of the most incredible JRPG experiences in Persona 4 Golden, while the 3DS has Tales, and the 3DS has SMT: Devil Survivor Overclocked (By the same people who created Persona) and Dragon Quest VII on the way. Notably these are all remakes, but that seems to be the way the handheld RPG market is leaning lately. There are excellent adventuring experiences on both systems, with OOT:3D and Assassin's Creed III: Liberation being two of my favorites. Both systems have excellent original downloadable offerings as well, and once Nintendo starts making more GB-GBA games available they each have access to many amazing experiences from older systems. The Vita is not lacking in amazing games, what it is lacking in are games that drive explosive system sales, just as the 3DS was not so long ago. I don't know if it will ever get a game that will sell the system to other people, but I do know that it has games that sold it to me, and I haven't regretted my purchase for a minute. @AceSpadeS If you think Sony has done a great deal for the gaming industry, you're not a gamer. You're a pretender. Sony could die tomorrow and it would be no big loss. In fact it could even be a good thing. It would send the industry a message: no more clone games, no more DRM, and no to high prices. @Gamesake Your trolling is getting worse by the minute. Two of those problems have nothing to do with Sony, and the third one barely fits, but there are far, far worse offenders out there (I'm specifically talking about the clones here. Gameloft would be a far better example to set if it would just stop being so G-ddamn successful). @CanisWolfred It's not trolling, it's the truth, and it takes a strong man to deny what's right in front of him. I'm impressed. @Gamesake Epic troll dude. As if Nintendo could not go down tomorrow. LOL. Squashing that rumor is all well and good, but whether MH4 is 3DS exclusive or multi-platform means little to me if there's no NA localization. Also, didn't the Vita's 2 joystick argument stop being relevant once the CPP was released? LOL Sony can't have Monster Hunter, they want it only if it's exclusive to them and Capcom recently said that at this rate no Sony console will see the game. How a rumor like that could take place with info like that? No more DRM? Please, do share where Sony was responsible for creating DRM? If you want to rant against DRM in terms of gaming, all three console manufacturers do not currently have stringent DRM policies on their systems. The PC gaming space is where the real DRM issue is at, and if you really want to view DRM as being evil, you should be targeting Steam, a DRM policy people are celebrating, not Sony. I personally don't mind DRM from Steam for most games, because Steam simplifies the process and is less obscene than some other companies, such as Ubisoft. In regards to the high prices, I won't deny the PS3 had a terrible launch price, but it didn't stay at that price. The consumers spoke with their wallets, Sony listened, and the PS3 has been a very good deal since then. The Vita was no more expensive than the 3DS when it launched, the memory cards can be found for much better prices than the MSRP if you're willing to look, and the system has been put on numerous sales since launch; I've spent roughly $300 on my system total and have a fairly expansive game collection and the memory to hold it. Sony's PS+ program offers quite the variety of free games, both AAA retail launches and indy hits, and puts games on sale regularly. Outside of that, the PSN store is very fairly priced and comparable (oftentimes less expensive) to the eShop. Nintendo's forays into the online marketplace and networks with the Wii U and 3DS are a clear product of Nintendo realizing their competitors had better online services and, and that they need to improve or be left behind. Just as Sony's forays into many different products have been inspired by Nintendo's software and hardware designs. Both companies are what they are today because they've pushed themselves forward in response to each other and Microsoft, and to ignore the impact that has had on the industry and wish that Sony would simply disappear is a terribly foolish choice. Now back to playing on my systems from all three parties. @AceSpadeS No one celebrates the Steam service for being DRM, they tolerate Steam for having 75% off sales and the ability to buy AAA titles for less than $10. One of the unwritten rules is to never purchase a game through Steam with third party DRM attached, such a Sony's SecuROM. It's just not worth the harassment. PSN is another place where Sony shines. And it's hard to imagine any gamer who'd be fanboy enough to agree with Sony's used games patent. You're right that Sony isn't responsible for creating all DRM, just some of the worst of it. In regards to the PSN being a form of DRM, of course it is. Xbox Live and the eShop are DRM as well, same as iTunes, Origin, or most any other digital distribution model. I don't find Sony's model any more or less restrictive than Nintendo's*, Microsoft's, or Steam's. If you could download and share your digital games freely, it's unlikely anybody would publish a game for that distributor. Gog.com is one of the very few examples of a DRM free digital distribution model that is successful, and even then it's mainly selling older games. For any most any other model though, your games are tied to a specific user ID, as with Sony or Microsoft, or a specific system, as with Nintendo, to prevent games being pirated and stolen. Now about the Steam service being celebrated, of course it is. Valve is a developer that is hugely celebrated, and often rightly so, for releasing quality games. These games are, of course, tied to Steam, and people certainly are willing to support that service. Millions of people use Steam as their primary way of buying, organizing, updating, and playing games because those services for those games are provided in an organized, well presented package. People don't celebrate the DRM directly, but they celebrate the convenience, quality, and value that having that DRM brings. The other point you make, about Bionic Commando Rearmed 2 (From your PSN link) being a place whee "Sony shines" is incorrect. The added DRM is a product of Capcom, not Sony. I would suggest reading the article fully before placing blame next time. *I hope Nintendo moves to tying eShop purchases to an ID soon, to allow people to move from one system to another without need to retain both systems. @Rei7 not scared of vita,but on to sony.the ps3 has been out 6 /7years. 3ds has been out 3 years and has out sold the ps3 thats funny handheld out sold a console. @AceSpadeS Sony's patent is giving you a little glimpse into their future. You want to support that? DRM doesn't stop piracy, what it does is make shareholders feel more secure about their investments and it hamstrings us poor suckers who buy games legally. It doesn't matter how popular Valve is, the gamers are there for the big sales. Without the sales, Steam wouldn't being doing any better than say, Impulse Driven. Even Valve has admitted as much. Capcom says it's Sony's DRM. I don't see any reason not to believe them. And I haven't needed a constant internet connection to play any of my games from the eShop so far. I quote from the IGN article. "It's one of the mechanisms that Sony has made available for third parties." It was Capcom's choice to implement the technology, Sony simply made it available. If I develop a way for you to protect your intellectual property from thieves and pirates, it's your choice to use it or not. Systems like that exist to convince developers/publishers to bring games to a system. I realize that I was wrong in saying it was Capcom's DRM, as that was what your original article lead me to believe, but my position is still that it was Capcom's choice to implement the technology. Why shouldn't Sony, Nintendo, or Microsoft give publishers options to secure their content? Piracy benefits no one in the long run. If it makes shareholders feel more secure, then its a good thing, because if the shareholders go, the company goes too. @AceSpadeS You shouldn't lay all the blame on Capcom and let Sony off that easy. It's a good point that Capcom made the choice to use Sony's DRM, not Sony. But Capcom is using that DRM just as Sony intended and on Sony's own online service no less. Sony could have put a stop to it but instead they're encouraging developers to do exactly what Capcom has done. I doubt that Sony would have bothered compromising themselves over a patent like this if they weren't serious about a way to circumvent the used games market. What Sony wants is bad for retailers and more importantly gamers. Sony won't be content until they have a stranglehold on everything you buy. Lucky for us nothing they make is very exciting. Now if only we'd get Ys: Forest Ocean In Celceta on the 3DS I'd have no reason to covet a Vita. @slim80 Not really funny as everything seems to be handheld right now. Since tablets, iPhones and iPad existed, everyone seems to be shifting towards portable gaming. Which is not really a surprise. I don't give a f actually since I own PS3, Vita, 3DS, PSP and an awesome pc rig. What I want is more competition in the gaming world. I'd get bored if I could only play Mario, Zelda and Pokemon all the time. I need more. Maybe the Vita will make more sails if they make MH4.